Heat oven to 350°F. Spray 13x9-inch pan (dark pan not recommended) with Crisco® Original No-Stick Cooking Spray or line with nonstick foil. Evenly arrange cookie rounds in pan. Bake 24 to 26 minutes or until light golden brown. Cool 15 minutes on cooling rack. Meanwhile, in 2-quart heavy saucepan, melt butter over medium heat. Stir in condensed milk, brown sugar and granulated sugar until blended. Add graham cracker crumbs; mix well (mixture will be thick). Bring to a boil, stirring constantly. Reduce heat to low; cook 5 minutes, stirring constantly, or until slightly thickened. Pour caramel mixture over warm cookie crust, spreading evenly. In medium microwavable bowl, microwave chocolate chips on High 1 minute to 1 minute 20 seconds, stirring every 30 seconds, until smooth. Stir in peanut butter until blended. 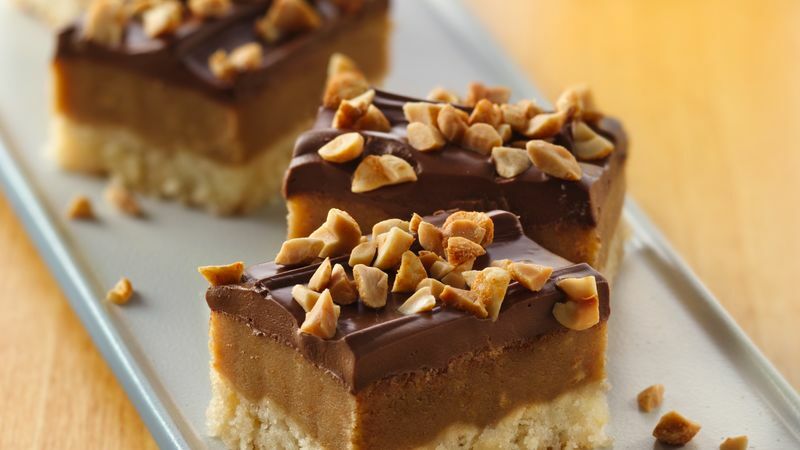 Spread evenly over caramel layer. Sprinkle with chopped peanuts. Refrigerate 1 hour or until chocolate is set. For bars, cut into 6 rows by 6 rows. Store covered in refrigerator.